I discovered New York’s Bibble and Sip from a Facebook video as it popped up on my newsfeed – gotta love the power and reach of social media. The idea of having a matcha cream puff (filled with a white chocolate matcha cream) was irresistible to me. 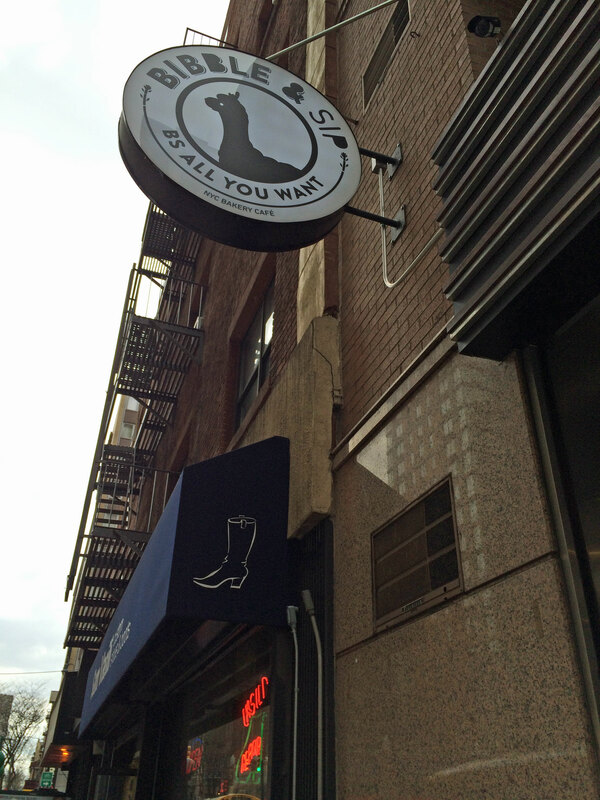 Bibble and Sip is located on W 51st Street in Manhattan (closer to 8th Avenue). I decided to go after the lunch rush, at around 2:00pm, and the lineup still went out the door! The good news is that they are super efficient in getting customer’s orders ready. Someone had taken my coffee order, and they were speedy at noticing that I was still waiting and quickly remade my order. They have house rules laid out on a post as you walk in to make their operation go smoothly. Some of the house rules include cleaning up after yourself. If your order is an eat-in one, make sure to bring back your tray, utensils, and mugs back to the counter so they can clean it, and it clears up a table for the next waiting guest. A lot of the surfaces to set your tray on also don’t have chairs (due to fire regulations) so there’s a lot of standing-room-only spaces which isn’t such a bad option considering that it’s a quick snack-and-go kind of establishment. The lineup does snake its way outside so it does get pretty loud but they are efficient at getting your order ready quickly enough that you don’t have to wait long to hear your name. Coffee is made traditionally (slow drip) and their treats range from breakfast options to desserts. They do also have an earl gray cream puff which I’ve decided I’ll have to try the next time I visit. As you can see in the picture below, the cream puffs are a sure sell, and they have rows and rows of fresh ones waiting to restock. Thank goodness for this, as that lineup only grew longer even after I got my order and walked out the door, about 45 mins later. I opted to have my cream puff at a park instead, so I made the trek down to Union Square as I was meeting a friend for Filipino food at The Ugly Kitchen in the East Village for dinner and Union Square was a nice little stop over along the way. While I was on the train with my Bibble and Sip to-go bag and cup of coffee, others actually commented and asked if it was the matcha cream puff that I was having. Turns out that Bibble and Sip is making their way into quite a trendy foodie spot. The cream puff was exactly the way I expected it to be, based on the video. It was creamy, but still very light and not overwhelmingly sweet the way some bakeshops would make it. Do take note of their pro tip: eat it upside down so all of the matcha cream doesn’t spill out. Foodies, tea lovers, and dessert lovers everywhere, make sure the next time you’re in New York that you take a trip and endure the lineup at Bibble and Sip! It’s well worth it!